Manage your multimedia files using the downloadable 2017 Classic software from Nero. With this software, you can utilize the classic file management interface to organize your music, photos, and video files. Burn and copy files to CDs, DVDs, and Blu-ray discs with the push of a button using Nero QuickStart. With SecurDisc 4.0 you benefit from 256-bit encryption, password protection, and disc optimization technology. Nero 2017 Classic also makes it easy to import and edit a variety of video files, including 4K and HD quality multimedia content. If the imported file isn't in the format you need, Nero 2017 Classic can quickly reformat audio and video files into a wide variety of popular formats. Once files are organized you can sync them to iOS and Android mobile devices using the Wi-Fi Sync App and even stream them to TVs and other devices with the free Nero StreamingPlayer App. The reinvented classic brings optimization in all areas: creative and rapid editing, maximum security for your burned files, high quality output, a straightforward export process, and the ability to enjoy your music, photo, and video files wherever you are, thanks to our proven evergreen. 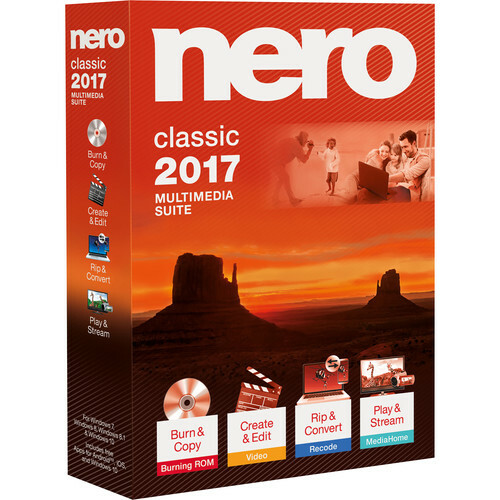 Whether it's on CD, DVD, or Blu-ray Disc, you can copy and burn your data with Nero 2017 Classic. With Nero QuickStart, it's now even easier, as you can access key tasks at the touch of a button. And with SecurDisc 4.0 including 256-bit encryption, password protection, and disc optimization technology, you can be certain your files will last. You can even burn high quality audio CDs with automatic sound enhancement and album art. Nero 2017 offers a variety of options for top-quality results and complete creativity for your multimedia files. Import high quality HEVC (H.265) clips or transfer 4K and HD videos to your computer from smartphones, digital cameras, and camcorders. Captivate your audience with express or advanced video editing using 4K video and more than 800 spectacular effects. Export individual scenes from long movies in one go. Add high quality, stylish menus to your DVD-Videos and Blu-ray Discs to allow you to jump straight to the scene you want, design sleeves to your taste with Nero CoverDesigner, and enjoy high-quality output for your music and videos. Whether video DVDs, audio CDs, video, or audio files Nero 2017 Classic converts almost anything into the video and audio formats that you need. It's especially easy to create job lists for scheduled conversions. And things are now easier than ever, with the 1-click conversion from video discs and audio CDs directly to your mobile device. Connect your device, select the tracks, transfer them - and you're done. Even the latest mobile devices are supported. And with Gracenote, you can now sort and play the music on your mobile device with the help of the album covers. Forget about endlessly searching for the right file: With Nero MediaHome you get an overview of your photos, videos, and music with the ability to sort by faces, places, and other tags, enabling you to easily include your media into your projects. Nero MediaHome is also a powerful video and audio player for your video DVDs, audio CDs, and music and video files, which you can also play with subtitles. The free Nero MediaHome Wi-Fi Sync App also keeps iOS and Android devices up to date with your media library. And if you prefer to play your multimedia life on a widescreen TV, you can stream the files to the TV or any other device on your home network using the free Nero StreamingPlayer App. Box Dimensions (LxWxH) 7.6 x 5.2 x 1.5"